Mubarak Vows to Restore Order: Will There Be Blood? As all eyes in the Arab world are riveted by Egypt's democracy uprising, activists in countries such as Jordan, Yemen and Syria have begun organizing protests against their own authoritarian regimes to demand reforms. Activists on Facebook pages such as "The Syrian Revolution" have called for a day of protests on Friday, with marches planned in front of the parliament in the capital city of Damascus  and at Syrian embassies around the world. But unlike Egypt, and even Yemen and Jordan, demonstrations in Syria are unlikely to pick up anywhere near enough momentum to seriously threaten the regime of President Bashar al-Assad. The reason is simple: Syria, unlike Egypt, Yemen and Jordan, isn't allied with the United States. 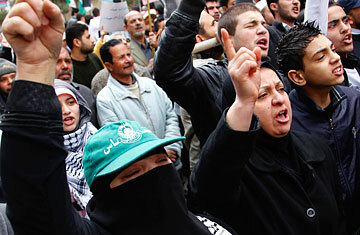 It's not that anti-Americanism is a driving force behind these Arab demonstrations. On the contrary, the rage of the Egyptian protestors is directed at President Hosni Mubarak, with America and Israel barely rating a mention. But being friends with America opens Mubarak to a host of liabilities that the Syrian government doesn't have. For one thing, Syria doesn't depend on billions of dollars in U.S. aid in the way that Egypt and Jordan do. The Assad regime, which has been a pariah country for years because of its support for various of the region's militant groups, gets only sanctions from the U.S. government, and comparatively little international aid besides. Its currency isn't traded on international markets. Its banking system is pretty closed. And its stock market is miniscule. Syria's central bank has been stocking up hard currency for years for just such occasions, and Damascus doesn't have the vast slums teeming with African-levels of poverty that Cairo has. That means that unlike Egypt  which, out of deference to the domestic sensitivities of its U.S. patron, chose to do its dirty work against democracy protestors in Tahrir Square with plain-clothed thugs rather than use an army funded by American taxpayers  Syria has shown precious little concern for world opinion in meting out domestic repression. Being on the wrong side of the Bush Administration's "democracy agenda" also helped the Syrian regime. While many Syrians resent the blatantly rigging of their country's elections, stability-Syrian style was preferred by many to the chaotic democracy created next door by the U.S. invasion of Iraq. Syria also has a few strategic cards  notably its support for Palestinian militants Hamas and Lebanese militants Hizballah  to play when necessary to divert attention from domestic discontent. And there's the fact that the country is still officially at war with Israel, which occupies Syrian territory on the Golan Heights: That conflict is the grounds on which Damascus keeps its state of emergency laws in force. But the advantages of being an anti-American Middle East authoritarian will begin to wear thin in the not-so-distant future, especially if the Obama Administration more firmly backs democracy in Egypt and pushes for similar changes in other U.S.-backed autocracies of the Arab world. Though its economic problems are less acute than Egypt's, Syria also has a huge population of young people who want more opportunity than Syria's closed economy can provide. And if the Middle East begins to have elected governments that deliver on the aspirations of their people, it will no longer be good enough for Syria just to be better than Iraq. See Fareed Zakaria on how democracy can work in the Middle East.